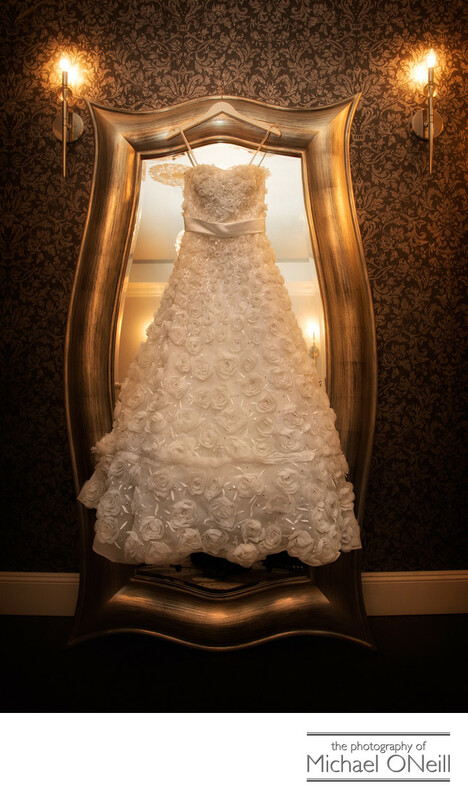 This lovely shot of the bride’s wedding gown was taken in her private bridal suite at Carlyle on the Green Caterers at Bethpage State Park in Farmingdale, New York. This classic, elegant venue features beautiful furnishings and appointments in every room as well as the spectacular Grand Conservatory Ballroom featuring Palladian windows overlooking the world renowned Bethpage Black golf course; two time home to the US Open golf tournament. There are few places anywhere that offer the sweeping views that your guests are treated to here. This detail photo of the bride’s wedding dress was captured using a combination of the natural ambient light in the room (including the two pictured sconce lamps) as well as some supplementary lighting from an electronic speed light mounted on my Nikon digital camera. I just loved the way the sinuous shape of this elegant full length mirror framed the bride’s dress when I positioned it carefully along the top edge. I created this photograph just minutes before the bride would step into this beautiful gown and see her groom for the first time in her wedding dress. This is always a very special moment at any wedding and this couple chose to share it just with each other. The look on the groom’s face when he sees his bride for the first time is amazing and I love to capture that moment in time for the couple to relive over and over again in the future.